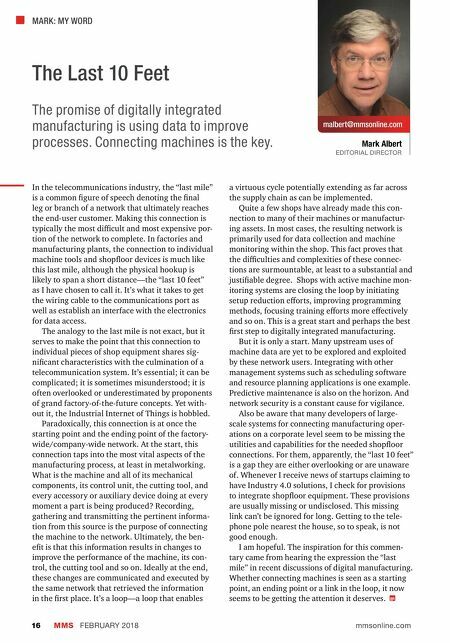 MARK: MY WORD malbert@mmsonline.com Mark Albert EDITORIAL DIRECTOR MMS FEBRUARY 2018 16 mmsonline.com The Last 10 Feet In the telecommunications industry, the "last mile" is a common figure of speech denoting the final leg or branch of a network that ultimately reaches the end-user customer. Making this connection is typically the most difficult and most expensive por- tion of the network to complete. In factories and manufacturing plants, the connection to individual machine tools and shopfloor devices is much like this last mile, although the physical hookup is likely to span a short distance—the "last 10 feet" as I have chosen to call it. It's what it takes to get the wiring cable to the communications port as well as establish an interface with the electronics for data access. The analogy to the last mile is not exact, but it serves to make the point that this connection to individual pieces of shop equipment shares sig- nificant characteristics with the culmination of a telecommunication system. It's essential; it can be complicated; it is sometimes misunderstood; it is often overlooked or underestimated by proponents of grand factory-of-the-future concepts. Yet with- out it, the Industrial Internet of Things is hobbled. Paradoxically, this connection is at once the starting point and the ending point of the factory- wide/company-wide network. At the start, this connection taps into the most vital aspects of the manufacturing process, at least in metalworking. What is the machine and all of its mechanical components, its control unit, the cutting tool, and every accessory or auxiliary device doing at every moment a part is being produced? Recording, gathering and transmitting the pertinent informa- tion from this source is the purpose of connecting the machine to the network. Ultimately, the ben- efit is that this information results in changes to improve the performance of the machine, its con- trol, the cutting tool and so on. Ideally at the end, these changes are communicated and executed by the same network that retrieved the information in the first place. It's a loop—a loop that enables a virtuous cycle potentially extending as far across the supply chain as can be implemented. Quite a few shops have already made this con- nection to many of their machines or manufactur- ing assets. In most cases, the resulting network is primarily used for data collection and machine monitoring within the shop. This fact proves that the difficulties and complexities of these connec- tions are surmountable, at least to a substantial and justifiable degree. Shops with active machine mon- itoring systems are closing the loop by initiating setup reduction efforts, improving programming methods, focusing training efforts more effectively and so on. 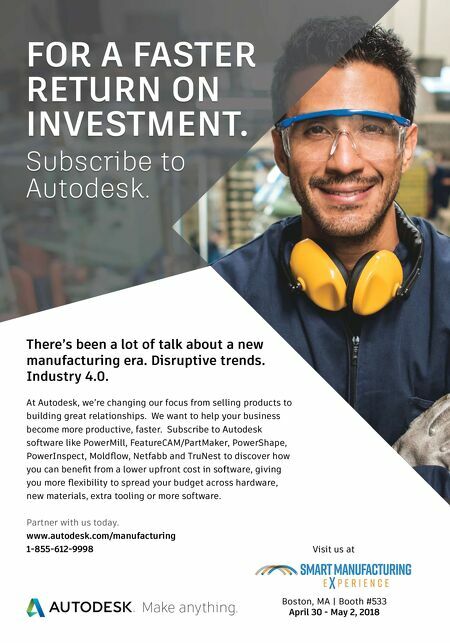 This is a great start and perhaps the best first step to digitally integrated manufacturing. But it is only a start. Many upstream uses of machine data are yet to be explored and exploited by these network users. Integrating with other management systems such as scheduling software and resource planning applications is one example. Predictive maintenance is also on the horizon. And network security is a constant cause for vigilance. Also be aware that many developers of large- scale systems for connecting manufacturing oper- ations on a corporate level seem to be missing the utilities and capabilities for the needed shopfloor connections. For them, apparently, the "last 10 feet" is a gap they are either overlooking or are unaware of. Whenever I receive news of startups claiming to have Industry 4.0 solutions, I check for provisions to integrate shopfloor equipment. These provisions are usually missing or undisclosed. This missing link can't be ignored for long. Getting to the tele- phone pole nearest the house, so to speak, is not good enough. I am hopeful. The inspiration for this commen- tary came from hearing the expression the "last mile" in recent discussions of digital manufacturing. Whether connecting machines is seen as a starting point, an ending point or a link in the loop, it now seems to be getting the attention it deserves. The promise of digitally integrated manufacturing is using data to improve processes. Connecting machines is the key.